Description of "Study Guide for 1Z0-055: Oracle Database 11g: New Features for 9i OCPs"
This Study Guide is targeted at Oracle Database 9i Administrator Certified Professionals who are looking to upgrade their credentials to the 11G release of Oracle. 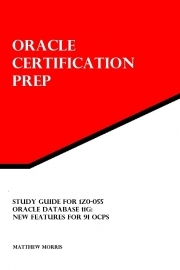 The book provides information covering all of the exam topics for the Oracle Expert exam: "1Z0-055: Oracle Database 11g: New Features for 9i OCPs". The books in the Oracle Certificaton Prep series are built in lockstep with the test topics provided by Oracle Education's certification program. Each book is intended to provide the information that will be tested in a clean and consise format. The guides introduce the subject you'll be tested on, follow that with the information you'll need to know for it, and then move on to the next topic. They contain no drills or unrealistic self-tests to bump the page count without adding value. The series is intended to provide a concentrated source of exam information that is compact enough to be read through multiple times. This series is ideal for experienced Oracle professionals that are familiar with the topic being tested, but want a means to rapidly reinforce their existing skills and bridge any gaps in their knowledge. It is also an excellent option as a second source of information for candidates pursuing certification. Matthew Morris has worked with the Oracle database since 1996 when he worked in the RDBMS support team for Oracle Support Services. Employed by Oracle for over eleven years in support and development positions, Matthew was an early adopter of the Oracle Certified Professional program. He was one of the first one hundred Oracle Certified Database Administrators (version 7.3) and was also in the first hundred to become an Oracle Certified Forms Developer. In the years since, he has upgraded his Database Administrator certification for releases 8i, 9i, 10G and 11G, and added the Application Express Expert and the Oracle SQL Expert certifications. Outside of Oracle, he has CompTIA certifications in Linux+ and Security+. Matthew is an experienced Database Administrator and PL/SQL developer and has been creating Web applications with Oracle Application Express since the early days of its release. He is currently employed as a Database Engineer with Computer Sciences Corporation developing enterprise applications. Reviews of "Study Guide for 1Z0-055: Oracle Database 11g: New Features for 9i OCPs"